Last month, Pixar delayed the release of The Good Dinosaur by approximately 18 months, leaving 2014 without any feature film from the studio. The announcement of the significant delay came eight months before the film was due in theaters, which must have left other units within Disney and Pixar, like their consumer products divisions, scrambling. New plans had to be developed in how the film would be marketed, and when new products and tie-ins would appear. A new teaser poster for the film is now making the rounds online, and it gives us a great look at the main characters of the film. Take a look after the break! At the D23 Expo, Pixar shared a few more details about the film, which takes place in a world where the meteorite that killed the dinosaurs never hit Earth, so the creatures never went extinct. The dinosaur that the title makes reference to is named Arlo, and he belongs to a family of farmers. He encounters a human one day, which he initially mistakes for a bug because he has never seen a human before. The poster above, posted online by JPosters.com.ar (via Pixar Empire), gives us our first official looks at Arlo and the human boy, Spot. It is somewhat puzzling as to why a teaser poster for the film is online when the next Pixar film is actually Inside Out, a film for which nothing aside from a piece of artwork has been released. These are definitely the character designs for Arlo and Spot, which we saw at the D23 Expo. The poster has clearly leaked before its intended release, as even though it says 2015, the official website posted below it is not yet live. The copyright next to Disney/Pixar on the bottom right is dated at 2013, so it seems that the poster was likely set to debut sometime later this year (if at all). From Pixar’s presentation at the Expo, we know that the film centers around the relationship between Arlo and Spot, which grows stronger through the course of the story. Pixar is quite good at hiding major parts of the story, so we will have to wait until 2015 to see where the film takes Arlo and Spot. The Good Dinosaur asks the generations-old question: What if the cataclysmic asteroid that forever changed life on Earth actually missed the planet completely and giant dinosaurs never became extinct? 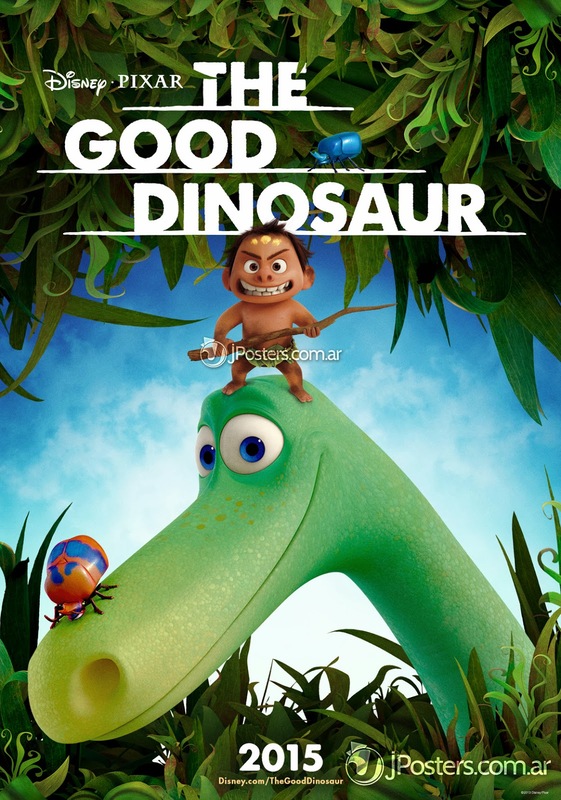 The film is a humorous and exciting original story about Arlo, a lively 70-foot-tall teenage Apatosaurus with a big heart. After a traumatic event rattles Arlo’s tranquil community, he sets out on a quest to restore peace, gaining an unlikely companion along the way—a young human boy named Spot. Thanks to Julian for the tip! UPDATE (10/28/13): It has been confirmed that the poster was not released by Pixar. Click here for more.